Whether you’re planning a family visit to New York or live in the area, crafts are a perfect way to stir your kids’ interests in all that New York has to offer. 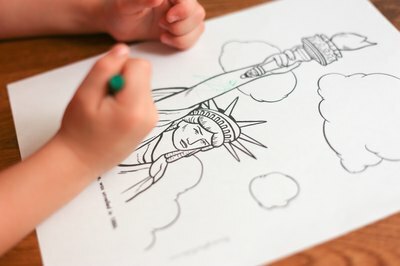 From the wide-open beauty of the Adirondacks to the museums and bustling adventure of New York City, there are many kid-friendly things to do in New York – and just as many New York-themed craft activities that your kids can do right at home. The New York State Museum, located in Albany, the state’s capital, has several ongoing exhibits including one on the native peoples of New York with a Mohawk Iroquois Village. Have your kids build an Iroquois longhouse, which was the traditional home of the Iroquois who lived in New York. You can print out the longhouse template from websites such as Archaeology Education & Illustrations by Susan K. Nelson. 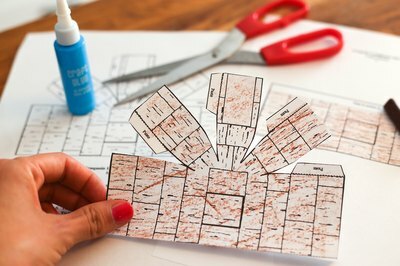 The kids can color it using crayons, then cut it out, fold down the tabs and glue the walls in place. North of Albany and encompassing one-third of the total land area of New York State is Adirondack Park, known for extensive wild landscapes and public forest. Adirondack furniture, popular throughout the area has a traditional twig and birch style. Help your kids make miniature Adirondack furniture by collecting twigs and using glue to create the tables and chairs you might find in houses and lodges in this wooded region. The Statue of Liberty, a copper statue monument in New York Harbor, was a gift of international friendship from the people of France to the people of the United States. Have your kids recreate the statue's torch by helping them cut pieces of red and orange streamers, and then letting them glue the streamers onto paper towel rolls. You can also teach your kids about the New York State flag, which is a modern version of a Revolutionary War flag and features the state coat of arms centered on a dark blue field. Print out an uncolored flag at apples4theteacher.com. Have your kids color it, and then glue a wooden craft stick to the side so they can wave it proudly. The New York Aquarium in Brooklyn, New York is the oldest aquarium in the country. To get the kids enthused about an upcoming trip there, help them create their own aquarium in a shoebox. Simply set the shoebox on its longest side, and have the kids paint the entire inside of the box sea green and blue. 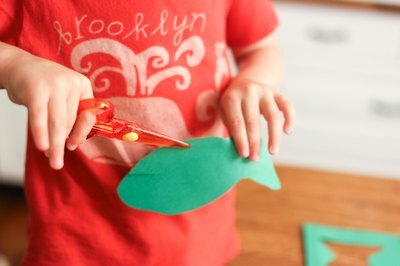 While they’re waiting for it to dry, help them cut out fish from construction paper or use foam fish from the craft store. They can also cut out some green sea “plants” from construction paper to paste on the bottom of the aquarium once it’s dry. Suspend the fish with a cord from the top of the shoebox -- and also use seashells to decorate the aquarium floor. Your kids will likely fall in love with the penguins at the New York Aquarium – and making their own paper penguins is easy and fun to do. Simply have them trace a shoe on black construction paper for the head and body of the penguin – and help them cut it out. The heel of the shoe will become the penguin’s head. Next, cut an oval from white construction paper to glue on the shoe print for the penguin’s belly. Then have them hold their fingers together and trace each hand on black construction paper. Cut out the two handprints to form the penguin’s “wings.” They can glue on mini marshmallows for the penguin’s eyes and cut out a small triangle from construction paper for the beak. Black and white cookies are considered an iconic New York City treat and sold in bakeries and delicatessens across the city. These cookies are thick and cakey, iced half in vanilla and half in chocolate. 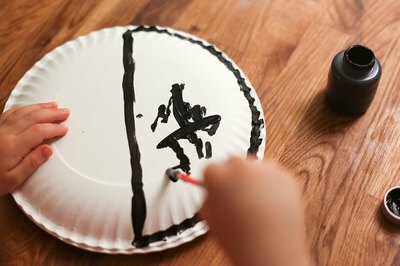 Help your kids get in a New York state of mind by making their own play black and white cookies from paper plates. Have them turn two paper plates to face each other, and then staple the plates together. Let them draw a line down the center and paint one side white for the vanilla side and one side dark brown for the chocolate side. Let it dry. Another New York treat is the chocolate egg cream, a classic fountain drink that originated in the city. Let the kids draw a glass and color the inside brown, and then glue white pom poms at the top of the glass for the drink's foam. MetLife Stadium, home to the New York Mets is located in the borough of Queens, while Yankee Stadium is in the Bronx. If your plan is to see a game at either stadium, let your kids make a banner to bring to the game. They can use regular poster board and markers – and you can pick up logo stickers and streamers in the team’s colors at a craft or party goods store. If your kids are really diehard fans, they’ll also want team paper pennants for their rooms. 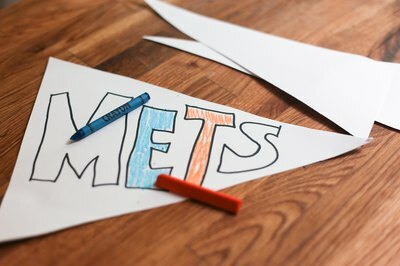 To create a pennant, cut poster board into a long, narrow triangle, have them print the team’s name down the center of the pennant, and then decorate it with sticker logos and markers.